Respondents use drag-and-drop to categorize items. 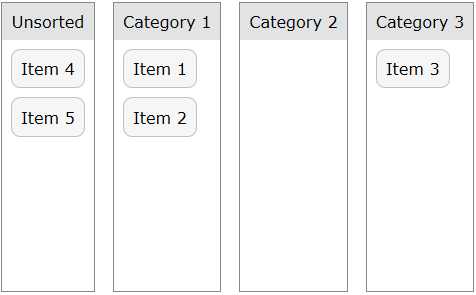 Uses jQuery UI's Sortable tool to allow a list of items to be categorized in ranked buckets. The list of rows must be set to the items to categorize. Rows must be numeric with require response disabled. The list of columns must be set to the categories. The label for the unsorted category can be changed on line 43 of the footer.